This is a holiday which commemorates the discovery of America in 1492, by navigator Christopher Columbus and his crew of 90 men. In Mexico it is known as Dia de la Raza (The Day of the Races) and is always celebrated on 12 October. Columbus believed that the world was round, and that a crossing the Atlantic Ocean would provide a shorter route to trade with Asia. Queen Isabella of Spain sponsored Columbus’ expedition. By being the first country to find a short water route to Asia, Spain could use the opportunity to claim new lands for colonization, profit from lucrative trade with Asia, and spread Christianity to Asian natives. On 3 August 1492 Columbus set sail with his three ships on his quest to cross the Atlantic. 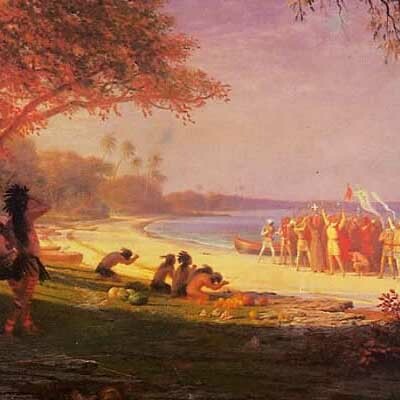 On 12 October 1492 they landed on what is now the island of San Salvador. They believed they had reached India. Since that time, Native Americans have been known as Indians. After 4 voyages to the New World, Columbus explored many of the islands of the West Indies including Cuba, and Jamaica, but never discovered the mainland. After an unsuccessful career as Governor of the Spanish West Indies, Columbus returned to Spain where he died. In Mexico, Columbus Day is a legal holiday and is called Dia de la Raza which means “the Day of the Races”. It commemorates Columbus’ discovery of America, and the history of the races which compose the Mexican people. It is a day Mexicans use to explore both their Spanish and Indian roots.